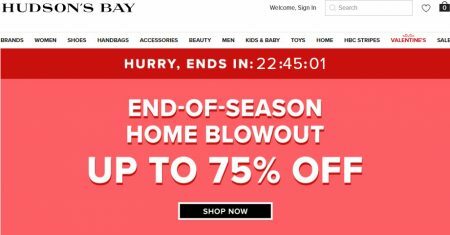 Hudson’s Bay is having a End of Season Home Blowout Sale! Save up to 75% off! Prices as marked. The sale is available online at TheBay.com and in-stores until Sunday, January 20, 2019. Hudson’s Bay offers free shipping on online orders over $99, or $45 with a Hudson’s Bay Credit Card. Click here to shop TheBay.com now or for more details.